The creature above made the list of eleven extinct animals photographed while alive. According to ecoworldly.com . . .
"The Bubal Hartebeest was a magnificent, tough beast which was once domesticated by the ancient Egyptians as a food source and for sacrificial purposes. The creature was even mentioned in the Old Testament. Although it once roamed throughout Northern Africa and the Middle East, the deep-rooted mythology which surrounded the animal was not enough to save it from European hunters who began hunting them for recreation and meat. 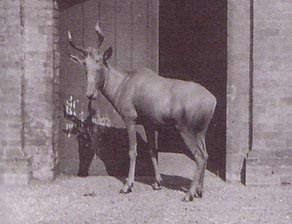 The last Bubal Hartebeest was probably a female which died in the Paris Zoo in 1923." See the other unfortunate creatures that made the list here. Ohhh! That is sad! :( R.I.P.!!! That's really sad.Unfortunatelly, there are people that don't give a damn about this. I am SO mentally cussing out China about that dolphin. And the poor little toad, died because of global warming. And the ibex they cloned. OMG, can you imagine? It's alive again for seven minutes, and then . . . oh. Awww poor Bubal Hartebeest! That is so sad. It is so cute. Why don't humans be more thoughtful sometimes? I mean, we would hate it if we were extinct. Would we hate being extinct? Or would we just lay there being dead? My favorite was the Golden Toad. Too bad it went extinct. Damn that climate change.